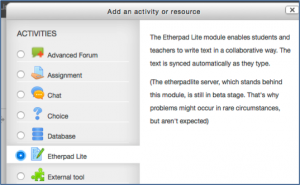 Etherpad Lite provides a shared workspace for students and staff. All updates are saved in real time unlike a file sharing system such as Dropbox. 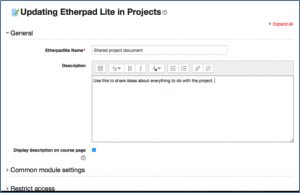 To start one, go to the relevant course on Moodle and Turn editing on. 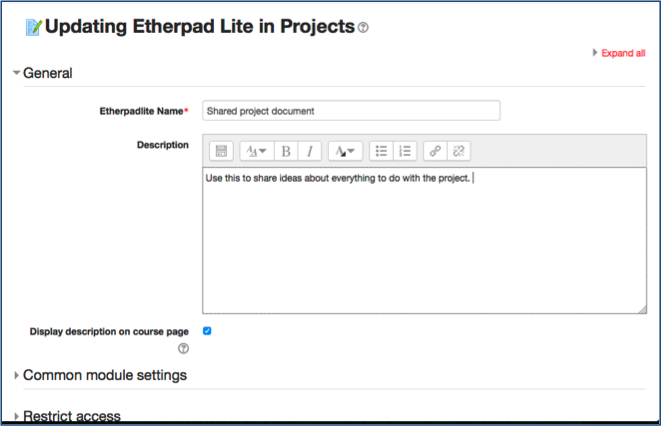 Click Add an activity or resource, select Etherpad Lite and Add. Give it a meaningful Name and, optionally, add a Description e.g. explaining its purpose and how it works. Click Save. 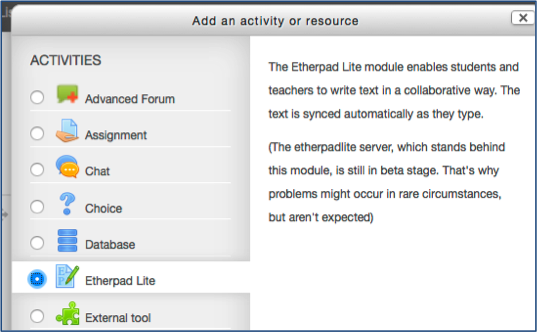 When you first access it, some explanatory text appears in the window. It might be an idea to leave this there for a while until people get used to the concept of a shared document of this sort. When you start to type, the text is highlighted – if someone else starts typing at the same time it appears in a different colour as below. The icon top right indicates how many users are active. Authorship colours can be switched off using the the cog (settings) icon. If you click the cog (settings) icon top right, you have options to open a chat window and whether authorship colours are active by default. You can also change the language and direction of text. The chat window looks like this when activated.